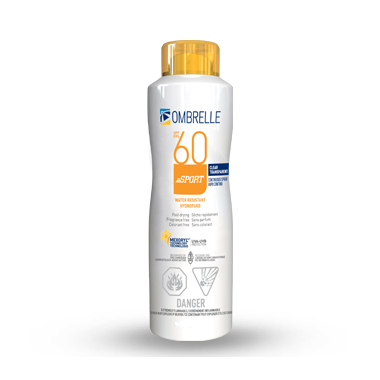 Discover Ombrelle's Sport SPF 60 Clear Continuous Spray that is specifically formulated for active individuals with ease of use and quick application in mind. Dermatologist recommended. This water resistant lotion spray can be sprayed from any angle and provides broad spectrum photostable protection against UVA & UVB rays. It's a great product, my favourite - I use it for my body and face while playing baseball. The best part is it doesn't run when you get sweaty and get sticky. Sprays evenly and does not feel greasy or sticky.